Often times with iPhone games, the simpler the better. Sometimes I just want a fun game that I can play for two minutes while waiting for a cup of coffee or standing in line. Aqua Hoops fits that need perfectly. 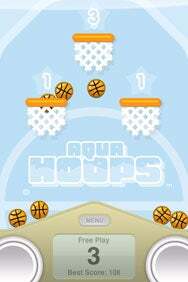 Have A Dunk: Tap on the buttons in the corners, and you can launch the basketballs through the virtual liquid and toward the hoops to rack up points in Aqua Hoops. Developed by Playtoniq, Aqua Hoops is a modern version of the water-filled basketball games you used to play as a kid. The harder you push the virtual plunger, the faster and higher the basketballs shoot up toward the baskets. The concept of the game is simple—launch as many basketballs as you can through the various hoops in a set amount of time—but Playtoniq nails some little details. Aqua Hoops includes the sound of sloshing water when you hit the plunger, and the water at the top of the screen sloshes when you tilt the device. The game also does a great job of using the built-in accelerometer, so you can twist and move the iPhone to reverse direction on a stray basketball that may be hanging on the rim. Playtoniq also offers a free version that’s supported by ads. With the $1 version, you get extra balls, customizable colors, and the ability to submit scores online. Either version will have you feeling like a kid again in no time. Aqua Hoops is compatible with any iPhone or iPod touch running the iPhone 2.x software update.